The US Department of Justice appears to be criminally prosecuting people for failing to satisfy Islamic religious standards, thereby putting the First Amendment's Establishment Clause at risk. The case concerns the financial empire of the Aossey family of Cedar Rapids, Iowa. To summarize briefly, last year the government indicted brothers Jalel and Yahya Aossey, along with two companies they operate, Midamar Corporation (Midamar) and Islamic Services of America, Inc. (ISA). Midamar distributes supposedly halal meat, which is to say, meat slaughtered according to Islamic law. Islamic Services of America, Inc. (ISA) certifies meat and other products as halal. Jalel, Yahya, and their father, William (Bill) Aossey, serve as corporate directors. Yahya is president of ISA. Bill is president of Midamar. Federal courts have generally declined to intervene in claims of religious fraud. ISA's website claims the company is a "globally recognized symbol of Halal integrity. Islamic Services of America is a leading Halal Certification body in the United States and North America, recognized internationally." Midamar's website claims it is "a trusted Halal brand that has earned a solid reputation for Halal integrity." Previously, Midamar's website also claimed the company was a "trusted Halal food supplier and sponsor for the annual conferences and conventions hosted by ISNA, CAIR, AMC, ICNA, and MAS, and W.D. Muhammad" – each of which has "had dealings with Islamic extremist and/or hate groups." It is unclear whether Midamar still supplies food to these groups. 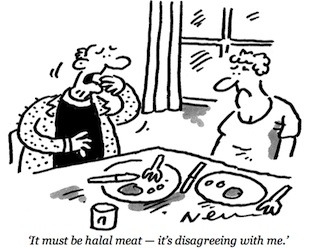 The government's theory is that the defendants sold non-halal meat by misrepresenting it as halal. Some of the claimed misconduct involved falsifying paperwork to make it appear as though the meat were slaughtered at a warehouse whose meat was halal, whereas in fact it was slaughtered at another warehouse whose meat was not halal. Other claims are even more obviously religious. For example, the indictment states, "Contrary to representations made by defendants... beef certified by defendant ISA as complying with the Halal slaughter standards... had not been slaughtered in accordance with the represented or required standards." It also claims defendants misrepresented "the manner of slaughter" and "the level of adherence to certain represented Halal practices and standards." Bill Aossey was separately indicted two months before the others. The charges against him were more straightforward and less encumbered with religious claims. 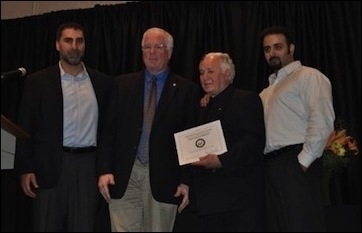 Bill Aossey (2nd from right) receives a certificate of recognition for 40 years of business in Iowa from Fred Schuster, Regional Director for Sen Chuck Grassley, in 2014, accompanied by his sons Jalel (left) and Yahya (right). On June 5, Jalel and Yahya Aossey, along with Midamar and ISA, filed a motion to dismiss some claims against them on the theory that the court could not decide whether they lied about the meat's halal status without making religious determinations that would violate the Establishment Clause. The defendants complain, "The United States Attorney's office seeks the criminal enforcement of adherence to Halal slaughter requirements of the Muslim countries of Malaysia, Indonesia, Kuwait, and UAE." It is possible that the charges are sufficiently focused on objective issues of false paperwork to survive the defendants' challenge intact. It is worth noting that last January, former Midamar operations manager Philip Payne pleaded guilty to falsifying US Department of Agriculture marks of inspection of halal meat shipments, "to give the false impression that shipments of beef complied with import requirements of Malaysia and Indonesia where the beef was shipped and also complied with US export requirements." Payne also admitted that some meat Midamar sold as halal was actually kosher. But federal courts have generally declined to intervene in claims of religious fraud, as noted in defendants' motion. In the 1995 case Barghout v. Bureau of Kosher Meat & Food Control, the federal Fourth Circuit Court of Appeals struck down a Baltimore ordinance making it a misdemeanor to sell non-kosher food mislabeled as kosher. Commack Self-Service Kosher Meats, Inc. v. Rubin is a 2000 case in which a federal court struck down New York State laws aimed at protecting consumers from fraudulent claims that food is kosher. In the 2013 case Wallace v. ConAgra Foods, Inc., the lower court declined on First Amendment grounds to hear plaintiffs' claim that the defendant "failed to slaughter cattle used in its products in compliance with 'objective' standards" required for the meat to be considered kosher; an appeals court later returned the case to state court on jurisdictional grounds. The ACLU is absent from the case, despite previously opposing a government role in identifying religiously acceptable food. One "usual suspect" has been notably absent from the proceedings. The American Civil Liberties Union has previously opposed government involvement in identifying religiously acceptable food. Besides representing George Barghout in the case noted above, it filed a lawsuit in 2009 challenging the constitutionality of a Georgia law, the Kosher Food Labeling Act. "By mandating that any food sold as kosher in the state of Georgia must meet the 'Orthodox Hebrew religious rules and requirements,'" the ACLU explained, "the challenged statute delegitimizes alternative interpretations of kosher adhered to in other Jewish communities." That suit was voluntarily dismissed after Georgia changed its law. Despite its track record on the issue, the ACLU did not respond to inquiry about whether it had any Establishment Clause concerns over prosecuting someone for halal meat violations. The ACLU's Iowa chapter likewise declined to express an opinion about the prosecution. Interestingly, ACLU-Iowa was previously on the same side as the Aosseys on an Establishment Clause issue. Back in 2003, the Aosseys were involved in a project of Muslim Youth Camps of America (MYCA) to build a camp on the shores of Coralville Lake. The proposed development tract was owned by the US Army Corps of Engineers, and would have included construction of a 36-foot high prayer tower, in addition to a conference center, cabins, and a caretaker's residence. Bill Aossey was MYCA's representative, and Jalel Aossey served as a board member. On that occasion, ACLU-Iowa had no concerns about the prayer tower on federal land violating the Establishment Clause. About the current case, ACLU-Iowa has taken no position. The government has not yet responded to the motion. The court gave it until one week after the conclusion of Bill Aossey's trial to respond. The trial concluded July 13 with a verdict of guilty on 15 of the 19 charges against him. Jalel and Yahya Aossey are scheduled to begin trial on September 28.